Issaquah Foot and Ankle Specialists have a solution to the ugly toenails caused by toenail fungus. The latest Laser technology can help you stop hiding your feet. Fungus is a common germ that lives in the environment and likes to live in dark, warm, and moist places. Our feet are in this type of environment all the time by wearing shoes and socks. The fungus starts in the skin and then migrates underneath the toenails. If you have a yellow, white or brown discoloration and thick toenails - you can suspect you have a fungus. You can pick up fungus in public places (hotels, showers, pools, and unfortunately for women, nail salons). A prescription topical and oral drugs have limited success rates, because the core of the problem is deeper than the nail plate. Laser treatment penetrates the skin underneath the toenail. It is safe and has no side effects or usage of drugs. 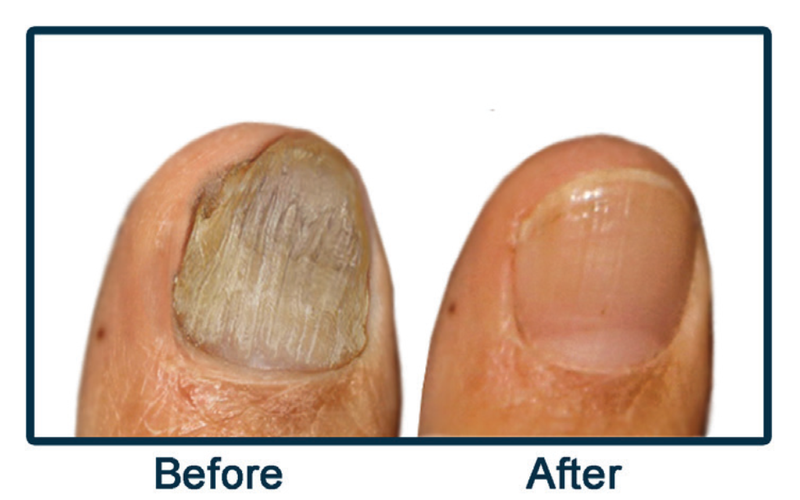 The laser light passes through the toe nail without causing damage to the nail or surrounding skin. Most people feel no pain and only a warming sensation. It takes only 10 minutes required to treat toenails on both feet. You will be able to walk in and walk out with no recovery time and eventually have beautiful toes!